Jesus died on the cross for our sin. 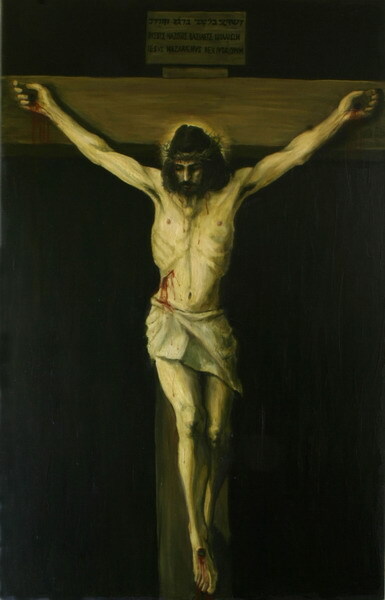 The cross was a very common form of execution used by the Roman Empire. It was especially employed to put anyone suspected of revolt against the Empire to a torturous death on display for all to see. It was not only a way to punish and kill the alleged offenders; it was a way to force others to think twice before they do anything that could be seen as rebellious. Lest they suffer the same fate. Jesus was executed by the Romans by being hung on a cross on a high place outside the walls of Jerusalem. He was seen by the Roman Empire as a threat. Jesus was seen as a threat to an earthly kingdom not because he was simply trying to die for the sins of the world. He was seen as threatening to such a kingdom because he was healing. And feeding. And driving out evil. And teaching. And judging. And he did it all as a Jew. He acted as a member of the people of Israel, whose God had called her together as a nation to submit to and to advance his reign on earth. This God had healed and fed his Israel and driven out evil from before her. He had given her instruction and taught her to pray. He had judged her even as he judged the world and claimed its entirety as his own. Jesus was seen as a threat to the kingdom of Rome because he was a threat to the kingdom of Rome. Jesus acted as the God of Israel. When they put him on the cross the Romans placed on the titulus “The King of the Jews.” This is the charge by which Jesus was put to death. Whether he really was such a king was no issue for Rome; it was the threat of another kingdom that called for his execution. The question before us is whether or not in his very own being, in his doing and not just his dying, Jesus was embodying and establishing the kingdom of God. Did Jesus come into our world to rule?